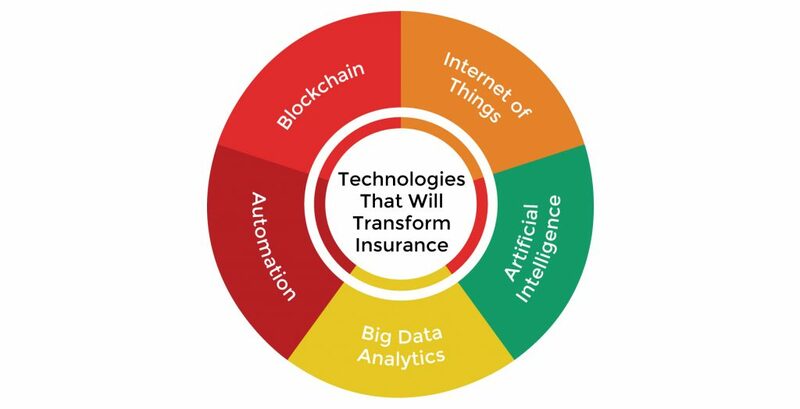 5 Critical Technology Trends in the Insurance Industry - Ignite Ltd. The financial world doesn’t have a reputation for setting the world on fire in terms of innovation. However, recent technology trends in the insurance industry are rapidly changing that perception. For fintechs, it’s an exciting time. Several new technologies are simultaneously hitting the market, transforming the way we work, live, and financially protect ourselves. It’s crucial for any insurTech provider to keep a close eye on how their work is evolving, so we’ve put together an extensive guide. Before we look at what technologies are changing the industry, though, let’s look at why. After all, technology is nothing but a tool to solve problems, so there must be problems to solve. According to Pew Research, millennials will outnumber baby boomers for the first time in 2019. Every industry has already been working hard to adjust to the needs of this relatively new customer base. Now, it’s time to fully commit. Millennials are spending more money than any other demographic, and insurance companies know that they need to meet their needs. So, what are their needs? 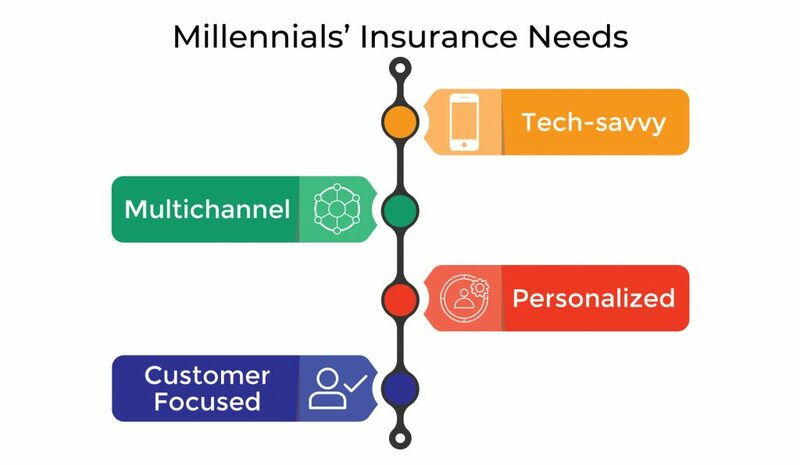 What are the characteristics of the millennial consumer, as they relate to insurance? Millennials grew up in a digital world, and they’re more comfortable with new tech than any other market segment. Insurance companies need to embrace this by offering tech-friendly features, like mobile apps and self-service. Speaking of mobile, millennials use their devices more than anyone else, and that’s saying a lot. Vendors need to reach out to them via web, text, email, and an ever-growing array of social media. Phone calls and snail mail are no longer enough. Millennials want their insurance to work just the way they need it to. No more, no less, and they don’t want to pay for things they don’t need. This goes for policy construction, which is undergoing some radical changes, and for marketing and customer service. And as for customer service, it’s one of the most important factors to millennials. Successful companies in the new world will be honest and upfront about serving their clients. Failing to do so, or worse, being disingenuous, will result in a quick loss of market share. At the same time, consumers are losing faith in the institutions that once formed the cornerstone of the business. Hacks, phishing, and identity theft have been in the news far too often over the past few years, and it’s resulted in some major changes to how we think about our personal data. The Equifax hack of 2017 received the most news coverage, but there has been a slew of security breaches over the past few years. What this points to is a need for trust. Insurance is an important business, and one that necessarily involves its users’ personal data. If users don’t trust that their insurance company can keep their secrets safe, then they will move to someone who can. In a world where technology is used to steal information, it follows that technology is what we will use to protect it. Many of the latest innovations in computing center around security, and insurance must embrace them if it wishes to survive. Of course, there are scores of new technologies that emerge every year. However, we’ve identified five that are having the greatest effect on the insurance industry. These are the ones to watch in 2018, whether you’re an insurTech developer, an insurance company, or just an interested observer. Blockchain, or distributed ledger technology (DLT), is already making waves in the insurance technology industry. Originally conceptualized for cryptocurrency like bitcoin, the technique allows for the decentralized storage of data of any kind. Boiled down, a blockchain is a security method by which data is secured against other data in the system. Every block, or piece of data, is encrypted using a hash of the data that already exists in the system. Change one block and the hash changes with it. Therefore, each block is continually verified against the records of everyone else on the chain. Anyone may view the data, with permission, but no one may alter it or even copy it. To boil it down even further, blockchain makes data a little more like physical objects. If someone is holding a piece of paper, for example, then you can look at it, but you can’t take it from them unless they let you. You certainly can’t snap your fingers and create a copy of it, like you can with traditional digital files. The security implications are obvious and astonishing. If personal data is placed on blockchain, then it’s immediately safe from hackers. Policies, medical records, and all the other information that goes into an insurance business can be locked up on the chain. If there is an attempt to tamper with or steal it, its owner will instantly know. Smart contracts built on blockchain will allow for claims to be fully automated. Consumers will maintain perfect control over their data, only allowing insurers access to it on an as-needed basis. Selling one’s own life insurance policy, currently a niche transaction, may become mainstream. Check our previous article on blockchain and the insurance industry for more detail. The Internet of Things, or IoT, is a well-developed technology by which non-traditional objects can be connected to the Internet. A connected car, a smart refrigerator, and even a smart watch like the Fitbit are good examples of IoT. For the insurance industry, it’s a way to protect investments, catching problems before they do damage. It’s also a way to verify claims, and to ensure that policy restrictions are followed. Here are just a few ways IoT will be or is already being used in insurtech. IoT is a boon for auto insurance, as carriers can get an exact readout on a vehicle’s mileage, position, and even driving habits. Maintenance problems can be detected, the car owner alerted, and the insurance adjusted if the problem is not fixed. We’ll go more into one of the major players in this area below. The same concept applies to people. Wearable heart rate sensors, pedometers, and more sophisticated devices can be used to track a person’s health. At its most drastic, these devices can warn the insured of a medical issue before it sends them to the hospital. At its most innocent, insurers can offer a lower rate to people who exercise regularly. Environmental factors such as rain, snow, and fire risk can be detected and integrated into insurance models. The event insurance sector is already investigating how this technology may be used. Policyholders can be warned to change their plans if there is a likely cancellation, or rates can be adjusted if they do not. All of this leads to lower rates, making it a win-win for insurance companies and consumers. The AI revolution is upon us. Recent trends in the insurance industry show that it is already being used, and the number of applications is only growing. AI will be a supportive technology, working along with blockchain and big data to provide a new and superior experience to the insured. Chatbots are big business now, with Microsoft, IBM and more dipping their toes into space. In a sales and customer service-centric industry like insurance, they’re going to be incredibly important. An AI insurance agent could draw on a prospect’s physical location and social media information to personalize the experience, as well as their requested coverage and policy information. They can answer questions about coverage far faster and more reliably than a human agent. The goal will be to make buying insurance easy and pleasant, eliminating human error and providing the best options to best serve the client. If the insurance industry relies on one thing, it’s data. Premiums and payouts are calculated based on an immense number of data points, from medical records to driving habits. Currently, professionals called actuaries analyze as much information as they can to determine the risks involved in any given policy. When a client fills in their age, location, and other personal information when applying for insurance, all that data is being used to figure out the likelihood of a claim. That likelihood, meaning the risk that the insurance will pay out, is used to determine their premium. With big data, these tasks can be automated, allowing for more complexity without increasing overhead. More complex, because they will take in far more information when making a risk determination. Actuaries and claims adjusters can only do so much, and a computer can do much more. In the future, risk determination will be done on an individual basis, rather than generalizing based on demographics. This makes risk calculation much more accurate, meaning any given person will pay a premium much closer to their actual risk. This will benefit some and hurt others, but it will be fairer. Automation is transforming offices in every sector, and insurance is only one of many to embrace the technology. Back-office efficiency has skyrocketed like never before, as all sorts of processes are being “outsourced” to machines. A customer-facing website isn’t optional in the modern insurance world. Clients need to be able to update their information, and they are not willing to wait for changes to be verified by a human employee. Automating the process saves time for everyone. Using OCR and smart management, policies, repair bills, and other important documents can be scanned and automatically filed to the correct client account. Insurance generates a lot of paper, but it doesn’t need to take over the office. Modern image recognition software is capable of some surprising feats. Automation tools are already available for the automotive insurance industry. These tools can take a photo of a car accident and provide a rough analysis, recommending repair, loss, or replacement before a human ever lays eyes on. So, the industry is changing. What does it take to survive in the new market? The best way to not survive is to ignore the transformation. Insurance is an old industry, and there’s a tendency by its biggest players to avoid new technology. New technologies, particularly blockchain and AI, combined with the new tech savviness of the average consumer, meaning that the old ways of doing things aren’t good enough anymore. People demand better service at a lower price than is possible without leveraging new tech. Some people demand products that simply couldn’t have existed twenty, ten, or even five years ago. Companies that were considered tiny, long-shot startups just a few years ago are taking over the industry. Lemonade, discussed in detail below broke into the top 10 insurance companies in terms of market share after just a few months in business. And they did it by embracing new technology. Of course, it’s not enough to use new technology. It must be used well, and in service of the client. Technology allows for new kinds of insurance, and it’s important to recognize which ones will be in demand by your customer base. Whether it’s microinsurance, a la carte coverage, or traditional policies at a drastically low price, insurTech is only useful when it’s leveraged to bring something new to the table. And what’s more, the biggest success stories are the one that think up entirely new ways to do so. A little further down, we’ll look at some companies that are doing just that. All of this adds up to the one fundamental truth to today’s consumers. Thanks to the Internet, people are exhaustively researching purchases of all kinds, from toasters to insurance policies. The modern customer knows how the sausage is made, so to speak, and they are wise to subpar products and services. The best way to appeal to these smarter, savvier consumers is by being honest and providing a solid product. Marketing spin can only go so far, and it’s less and less effective the more it’s used. New technology is more than just buzzwords. It must be used to serve the customer, or they’ll happily go elsewhere. Whether it’s price, unique products, or stellar customer service, there needs to be something that truly differentiates an offering. Several insurance companies have taken these truisms to heart and are already finding great success because of it. Let’s look at four of the most revolutionary. Metromile, founded in San Francisco in 2011, has one of those. The automotive insurance company lets customers drastically reduce their monthly premiums through the simple expedient of only charging them for the miles they actually drive. After all, no one’s car was ever in an accident while parked in their garage. Of course, making this idea a reality wasn’t quite so simple. After all, how can you keep track of how far someone drives on any given day? It’s not practical to look at the odometer every day, is it? Using the car’s OBD-II port, a diagnostic connection present in all cars since 1996, Metromile keeps a constant readout on mileage and other data. Metromile provides a free dongle to all their clients, in effect turning the vehicles into IoT-enabled devices. There are some fringe benefits as well, which the company successfully turns into selling points. The dongle has a built-in GPS, letting clients use a mobile app to locate their car in a parking lot or in case of theft. It also alerts clients to engine codes and maintenance conditions, letting them fix issues before they turn into real problems. Since Metromile’s success, some of the largest names in insurance have followed them. State Farm, Allstate, and others now offer their own IoT-powered pay-by-mile insurance plans. One of the big winners in the new world of technology-based insurance, Lemonade has become a juggernaut in the rental insurance market. And they’ve done it in less than three years. Founded in 2015, the startup leverages big data analytics and artificial intelligence to automatically determine precise risk factors and premiums for their clients. New prospects can sign up online, working with a chatbot named “A.I. Jim” to process their application. “Jim” handles claims as well, instantaneously cross-checking reports against anti-fraud algorithms and approving or rejecting the payment. Lemonade even uses psychology in their business model, applying the principles of behavioral economics to discourage fraud. New clients sign a digital pledge of honesty as the first step in their application, promising not to file false claims. When a claim is filed, the insured is asked to record a video describing the loss, rather than filling out an online form. The effectiveness of these techniques can’t be denied. Lemonade holds an amazing 1% market share in their home state of New York, outpacing established giants like GEICO, State Farm, and Allstate. The lesson here is one – creativity. More than anything else, Lemonade is willing to try new things, to wholeheartedly dive into new ways of doing business. Life insurance has historically been a grueling, complicated process. Endless questionnaires, lab appointments, and physicals, only to have a rate set far too high. Ladder, launched in 2015 with coverage in California, seeks to boil the process down to its basics. Prospective clients apply for a policy using their mobile devices, answering just a few simple questions. Using the latest risk assessment techniques, Ladder makes an on-the-spot determination if more information is required. If, so they send a lab technician to the customer’s home or work at no charge. And that’s it. After approval, the customer pays a reasonable rate for term life insurance, and they’re done. Ladder is the perfect example of the “customer-first” mindset that’s so important to the modern market. By staying honest and keeping things simple, they’ve managed to become a major player in the life insurance space in just a few years. Today, the company has expanded to offer coverage across the US, with about $50mm in funding since 2015. Insurance startup Trov, pronounced like “Trove”, is perhaps the most innovative company on this list. Rather than offering an existing style of insurance in a new way, they are bringing something entirely unique to the table. Trov brings micro insurance to the mainstream. A single policy covers a single item, whether that be a bike, a musical instrument, a camera, or even a gaming console. This is a type of insurance that’s been available in the past, but only for extremely high-value items, such as rare jewelry. By comparison, Trov offers coverage for a wide variety of items, and all it takes to buy a policy is a photograph and proof of value, such as a receipt. The company has hit upon a real niche in the industry. The items they cover are typically ones that travel, such as with a band or on a vacation. Thus, they carry a perception of risk, and their owners have proven more than happy to buy small, inexpensive policies to cover them. By leveraging big data and automation, Trov makes it financially feasible to offer individual item insurance to more people than ever before. And the people are buying. By 2017, the company had raised a total of $85mm in funding. It’s a bold new world out there, and the best way to navigate it is with a competent guide. Whether you’re a software developer looking to diversify into insurtech, or an insurance company that sees the need to update your offering, you need a technology partner. Ignite has lived on the bleeding edge of tech for over a decade. With over 150 successful projects in every sector of industry, we can work with you to upgrade your operations. Whether you have a firm idea in mind, or need a consultation to see what’s possible, our experts can guide you every step of the way. To speak with a project manager, just fill out the contact form. We’ll be in touch shortly.